Rhythm games don't come along as often as they should. During the days of the PS3, games like Guitar Hero and Rock Band ruled the genre, but before that, you had Rez, DDR, and Space Channel 5 on the PS2, and finally Parappa the Rapper on the PS1. Now, we have a new contender on the PS4 in the form of Invector. This colorful and smooth rhythm game features a track list from the Swedish DJ Avicii, who is a well-known artist in the EDM world. Does this game captivate and hypnotize your senses, or does it play too many wrong notes? Time to find out! Invector has a light story that involves a spaceship pilot named Stella. As you progress through the game's track list, short animated cutscenes give you a look into her personality and the struggles of an EDM spaceship pilot. As Collector Pilot H45H1M, she will visit numerous planets and run into a few obstacles along the way. She's a fun and exciting character, thanks in no small part to the performance by Maya Tuttle. Beyond the game's premise, you'll visit several vastly different worlds in your journey through the games musical tracks. With three widely different difficulties and split-screen support for up to four players, it's a solid amount of content. Of course, a game like this lives or dies on its music. As an Avicii fan, it was very easy to love every track in Invector, but I showed the game to several friends of mine who were passing EDM fans, and even one who has never listened to Avicii before. Everyone really enjoyed the music here, proving that Avicii is more than just a talented DJ. His music appeals to a wide range of people, and while some tracks are less successful than others, the majority of them were an absolute joy to experience inside of Invector. Let's see how the gameplay holds up. Invector went through several major changes during its development, and I'm pleased to say that all those decisions resulted in one of my favorite rhythm games to date. The developers opted for handcrafted levels across three massively different difficulty settings. The songs get more difficult as you go down the list regardless of your difficulty setting. This means that earlier songs on easy are less difficult than later songs on easy. The subtle difficulty curve also means that you'll be able to slowly acclimate yourself to higher difficulties as you move down the list. Levels involve flying down transparent tracks and hitting or holding buttons as you also follow movement indicators. The shape of your track is a triangle, meaning that you'll have three sides to rotate across as you travel. 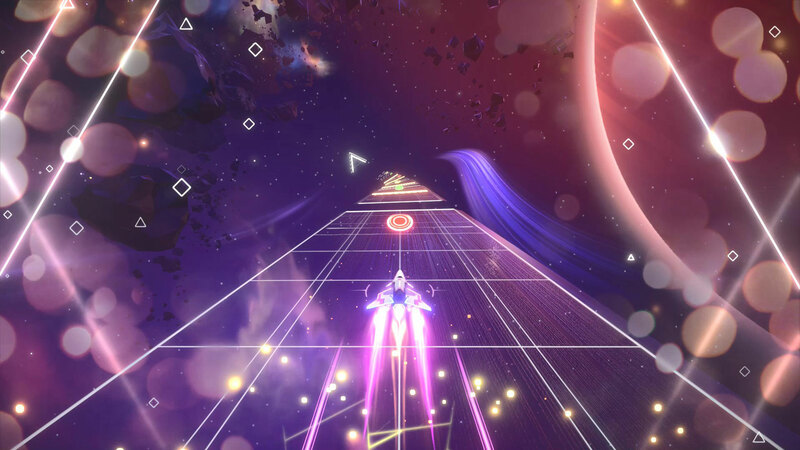 On easier difficulties, arrows will indicate when it's time to flip the track, but in more intense songs, you'll need to rotate the track or risk watching several buttons fly over your head. Yellow lines and triangle-shaped borders indicate where you should tap the L1 button. All other face buttons are presented on the track itself. When charged, you can shake the controller to activate a boost mode, but doing so during a challenging section can really mess you up if you're not careful. Finally, there are segments where you leave the track for a brief time to fly through rings that appear in the level. As you pass through each ring, you get a boost and your ship does a few rolls as a flourish. You land gracefully back on the track after these flying sessions and continue your rhythm gameplay. The mixture of rotation, rhythm gameplay, and the serene flying segments, to me, was the perfect cadence of gameplay. Other segments where your ship bounces across pieces of the track also add a visual flourish to the proceedings. I was able to finish the game on easy without too much difficulty, but medium quickly showed me how hard it can get. Don't even get me started on the hardest option. There's absolutely enough challenge here to keep rhythm fanatics busy. The selection of Avicii music has a nice mixture of fast-paced EDM and slower songs that never feel repetitive. It doesn't have the gimmick of a plastic guitar or a mini DJ table, but Invector makes good use of the DualShock 4 and its unique gameplay elements to keep things interesting throughout your experience. 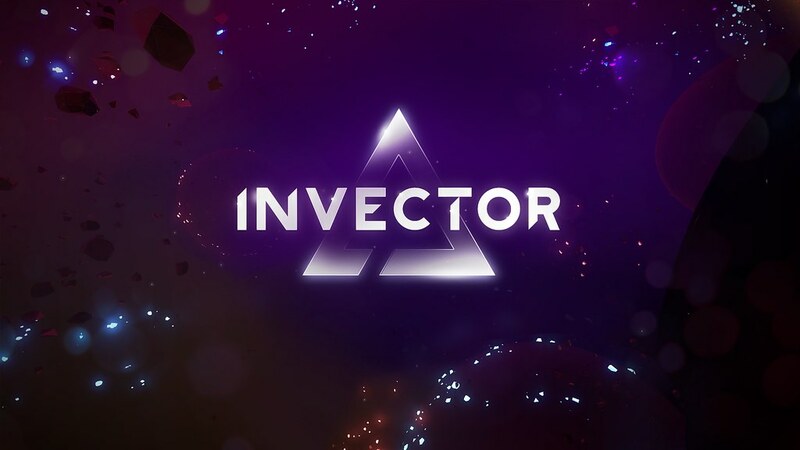 The combination of catchy Avicii music and sharp colorful graphics makes Invector one of the most beautiful rhythm games I've played. The environments offer a lot of variety as you move from planet-to-planet, and the music gives everything a lofty and psychedelic feel. The incredibly smooth frame rate is the icing on this delicious EDM cake. I absolutely love the intense particle effects, polygonal structures, and bright colors in this game. I would have loved to see it in VR. I don't really have much to say about Invector that isn't positive. If you hate EDM, it may not be for you, but I consider Avicii to be a pretty easy artist to listen to for anyone. I would have liked to see a wider range of EDM tracks and perhaps even VR support, but these are just small requests. What we have here is a very solid, very fun, and positively gorgeous rhythm game. In my opinion, games in this genre can't do much better than Invector.